In what was another eventful week in the world of Bitcoin: Bitcoin passes $11000 on 20 day high, CFTC offers a $300,000 crypto bounty, Berkshire Hathaway calls Bitcoin a noxious poison, A trader is chargers with $2 Million Bitcoin theft, The Polish Central Banks funds anti-crypto video, and Bitcoin hinders the search for alien life. 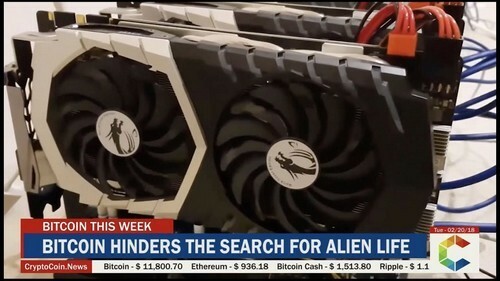 Researchers from the Search for Extraterrestrial Intelligence, also known as SETI, have said that their plans to extend the capacity for listening out for alien life is being hampered by the recent widespread global craze to mine cryptocurrency and the corresponding massive market demand for Graphical Processing Unit cards (GPU’s). Scientists use stacks of GPU cards for extra computing power to listen on many different frequencies but since trying to buy more cards recently in an effort to expand their capacity and increase their computing power, their purchases were denied by suppliers who have said that there are none available. It has been reported in the Polish media that the National Bank of Poland has been funding a Polish prankster/blogger to produce an anti crypto video. The video is a cautionary tale of “How I lost my money” through being involved in cryptocurrency. As of right now, the video has received over 500,000 views. It is not disclosed anywhere in the video that the creation of the video was an act of sponsorship, a required act by any content creator when receiving money from a company in exchange for producing a video. A scanned letter showing a response to a direct inquiry to the bank on the funding has been circulating channels of media and at the moment the Polish National Bank has not yet replied to the dozens of press inquiries on the subject. The Central Bank of Poland spent 91,000 zloty ($27,100) on the campaign with the money going to Google, Facebook and the aforementioned Polish Youtube partner network called Gamellon, according to Money.pl. An assistant trader from the company Consolidated Trading LLC is facing criminal prosecution for the theft of Bitcoin as well as Litecoin up to the value of $2 Million. The man in question, 24-year-old Chicago local Joseph Kim, is accused of transferring the money to his personal wallet to cover his trading losses and then lying to try to cover the matter. It is reported that of the approximately $2 Million that was stolen, only $1.5 Million has been recovered. Charlie Munger, the 94-year-old Vice Chairman of Berkshire Hathaway, has followed the lead of his Chairman Warren Buffet to air his views on Bitcoin. He recently described Bitcoin in a company communication as a “disgusting, detestable, noxious poison” saying that active steps should be taken by the American authorities to stamp it out. Munger admitted that the technology might be interesting but the investing frenzy around it over the last year should have prompted a government crackdown like the one in China, he said. Munger follows classic investing advice, never invest in something that you don’t understand. Despite Munger’s lack of understanding on the subject, he is very quick to state that someone out there is “capable of somehow creating more bitcoin”. In addition to this, he has also rehashed the criticism that Bitcoin is only for “crook, crazies, egomaniacs” etc. and advises that people avoid Bitcoin “like the plague”. The US Commodity Futures Trading Commission (CFTC) has issued a press release warning people of the dangers of getting caught up in notorious “pump and dump” schemes when investing in cryptocurrencies. The CFTC describes how, with the help of modern messenger apps, fraudsters can falsely pump the value of a coin and can even go so far as to orchestrate the dumping of a coin with amazing speed. They are also offering rewards to those can break up such schemes, stating that information leading to the tear down of pump and dump schemes could result in 10-30% of the total value of the scheme being given to those responsible and those who aided the demise of the schemes. Bitcoin has been growing and rallying positively over the last week and it has seen a rise of close to a third of its value, taking it to a high of $11,562 at present. Some have been touting Asia, or in particular Japan as being the leading market that has been spearheading the renewed growth. With sentiment starting to show bullish signs from many analysts, it is worth noting that one Bitcoin investor, in particular, has purchased $400 Million worth of Bitcoin in the last week. Buying in the dip has never been more extreme!